Veel visuele trucs als een torn and restored en een color change maken vaak gebruik van gimmicks. Maar wat nu als we je vertellen dat Avi Yap een concept bedacht heeft om deze trucs zonder gimmicks te doen en toch SUPER visueel zijn! Aan zijn eigen routine heeft hij meer dan 4 jaar aan gewerkt. Hij heeft vele grote namen als Dave Buck, Daniel Prado, Shawn Farquhar, Harapan Ong en Gregory Wilson al verbaasd. Je kunt bijna niet geloven dat datgeen hij doet ZONDER gimmicks werkt! Als je je vingervlugheid met kaarten niet 1, maar 10 niveau's omhoog wilt brengen, dan is dit echt de DVD die je moet hebben. "WOW FOOLED ME!! I suspected a gimmick because it looks too perfect. Oh, was I wrong. 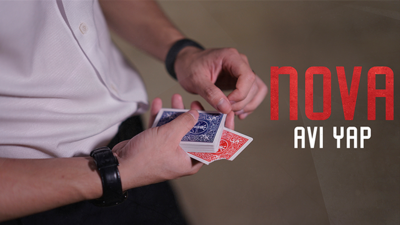 Nova is one of the best examples of visual sleight of hand card magic I've seen in a while!" "Avi Yap has created a mind-blowing visual effect that brings magic back in the game. It is rare to see something that looks like real magic. It is a rich technique with lots of applications. If you are into sleight of hand, this is a must learn!" "It's a slick visual move with lots of potentials to create many effects." "Avi is one of Singapore's rising young stars in magic who combines slick sleight of hand and eye-popping visuals to his magic. He has taken a standard card flourish and made it into a thing of magical beauty. His execution is flawless." "I LOVE this move!! This breathtaking move is not easy, but soooooo worth the time and effort required for your card man arsenal!!" "Might you consider this move like a knob: it might open a door to infinite possibilities, or you might just end up using it to break someone head with it. Either way, a win-win situation."